In addition to taking proper sun precautions, we can also nourish our skin from the inside to help us naturally reduce damage from sun exposure. Eating an antioxidant-rich diet along with foods that also reduce inflammation can give the body a bit of natural, internal sun protection. 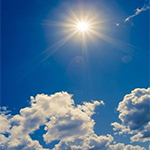 Free radicals generated from UV light exposure contribute to cell damage, aging, and increase the risk of skin cancer. Antioxidants work to quench free radicals and stop their harmful effects. Some antioxidants you may recognize include vitamins A, C, and E, selenium, beta carotene, and lycopene. There are literally thousands of compounds in plant-based foods that act as antioxidants and anti-inflammatory agents, many of which we have yet to discover. These compounds provide the plant protection from excess UV light and when consumed by us as food, end up in our tissues providing a similar benefit. A study published in the Sept 2007 issue of Molecular Biotechnology found that after about 3 months on a flavonoid and carotenoid-rich diet, volunteers showed a decrease in sun sensitivity. Carotenoid-rich food sources include carrots, spinach, sweet potatoes, kale, and other dark leafy greens. Flavonoids are also found in these foods and other vegetables, fruits, nuts, beans, seeds, and whole grains. Over 4000 flavonoids have been identified and many provide antioxidant and anti-inflammatory health benefits. These various phytochemicals contribute to the plant’s specific color, so fruits and vegetables with deep or vibrant colors usually contain the most flavonoids. Some examples include anthocyanidins which can be found in blue, purple and red berries, catechins found in almonds, tea, chocolate, and grapes and quercetin is found in apples and onions. Black, green, and white tea are a rich source of flavonoids and catechins with the main catechin being the antioxidant EGCG. A 2007 study of 400 foods by the USDA found that green tea contains the most catechins, with 127 mg per gram of tea in about 3 ½ ounces of water. Emerging research suggests that consumption and topical application of EGCG can help protect the skin from UV damage and skin cancer. A study published in 2011 in the Journal of Nutrition found that women who consumed a beverage containing green tea polyphenols (1402mg catechins) over a 12 week period were able to protect skin from UV damage and improved overall skin quality. Keep in mind regular brewed green tea will contain more catechins than decaffeinated, bottled, or instant tea which typically contain much less. You can also find it in topical beauty products that contain EGCG or ‘green tea extract’. Natural raw cocoa contains very high amounts of flavanols, but processing can greatly lower the amount. Look for good quality dark chocolate that contains at least 65% cocoa or 100% unsweetened cocoa powder to mix in shakes, foods, or beverages. A study published in the June 2006 issue of the Journal of Nutrition found that women who consumed a concentrated cocoa beverage-rich in antioxidant flavanols, had a reduced amount of skin roughness and scaling after exposure to UV light. Women in a low-flavanol cocoa group showed more skin damage. The higher amount of antioxidant flavanols in the concentrated beverage provided more UV protection.